Located in the lower level of Kulp Residence Hall, this space is set aside as a place for prayer and meditation. It’s also known as the Quiet Place. Located in the Church-Chapel, this is another place set aside for prayer and meditation, open during the day. Opportunities are available for students who are interested in meeting together in small group settings. For more information, contact the campus pastor. Located on the west side of Main Street between campus and College Cabin is a wonderful 18-acre arboretum of native shrubs and trees. It’s an excellent place to spend time with God in nature. The Goshen College labyrinth is a place for prayer and meditation in the lawn north east of East Hall. The labyrinth is a replica of an ancient labyrinth constructed around 1220 CE, in the stone floor of Chartres Cathedral, France. This design has 11 circuits, or concentric circles, with a twelfth one forming a six-petal rosette at the center. Prayer Odyssey is an annual period of round-the-clock prayer for our GC community, our families, our communities and our world, in the prayer room in Kulp. This year’s prayer booklet contains a dozen student-written devotions on the 2017-18 Campus Ministries theme, “Blessed are the Peacemakers.” We live in a tumultuous world where peace often seems out of reach. People and nations bicker, fight, and refuse to listen to one another. Many of us suffer internally from worries, doubts, anxieties, and other real-life struggles. Is there no relief? Where is that light at the end of the tunnel? This is where you come in. 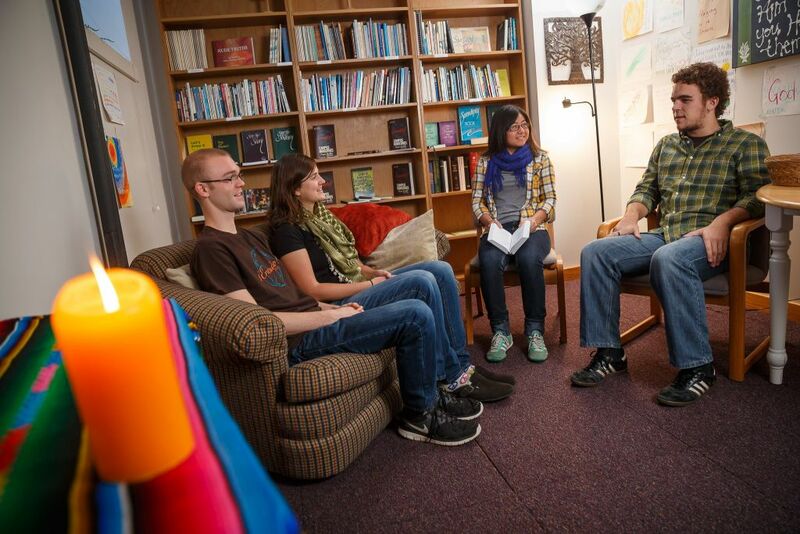 Are you willing to offer relief to your peers at Goshen College? If so, become a peacemaker. Be a supportive, listening presence for those gripped with anxiety and depression. May these devotionals nourish your soul and spur on your creative imagination for practical, relevant and timely peacemaking initiatives on our campus and community that will enable people to experience a taste of the shalom that Jesus talked about. Download the GC Prayer Booklet for the 2018-19 school year.